Marie Antoinette uses her children for publicity, much like reality tv stars; when will heads roll? One of 30 portraits commissioned by Queen Marie-Antoinette from her favorite painter. Created as an antidote for the infamous diamond necklace scandal- the Queen was accused of attempting to defraud the crown jewelers of a very expensive (2800 carats) diamond necklace, and her image was forever tarnished. In 1887 the portrait was supposed to be exhibited in the Painting Salon. 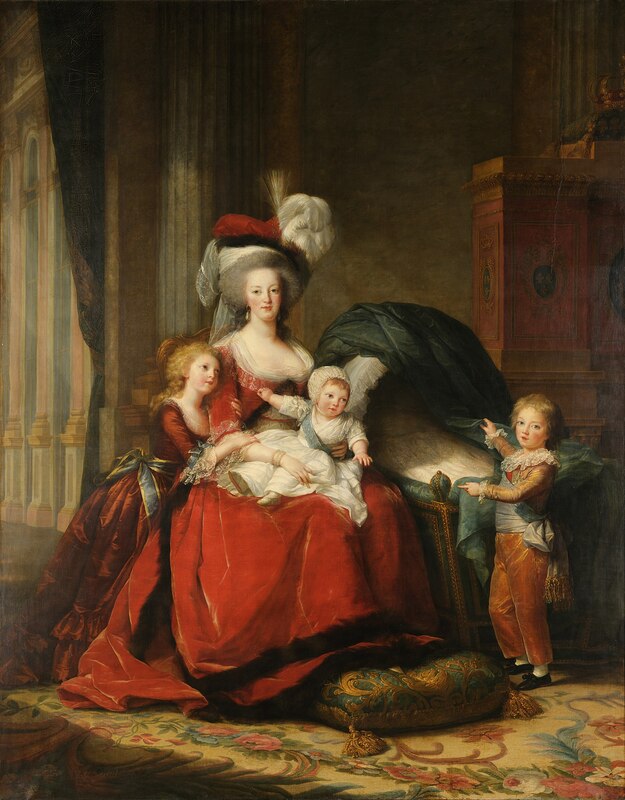 However, the Queen's reputation was so bad, Vigée le Brun feared that the public would rip the painting to shreds. The empty spot on the wall prompted the famous retort "Here's the deficit!" Apparently, the portrait with her dear children did not change anybody's opinion about the Queen, 'cause she was beheaded a few years later.